The forecasted low in the bay, which did not form, just got converted into a "mini" off shore trough along the T.N.coast. The result was good rains from feeder Southerly winds into the trough vortex, and precipitating good rains for T.N.including Chennai getting thunder showers. The southeast coast may see rains tapering off by Friday. The monsoon axis is now due to shift North again. Hopefully, for the regions directly under the rainfall areas, it would stay there for a week. 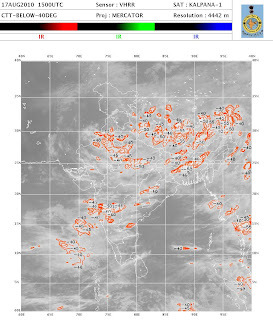 Consequently, IRI has forecast extremely heavy rains for parts of West Nepal and adjoining Himalayan foothills along Uttar Pradesh. The systems, ones active over India today are the monsoon trough and the upper air circulation over North-West Rajasthan, and the re-activated off shore trough along the West coast. North: Heavy rains in Utterakhand, U.P. and parts of Bihar. heavy falls in West Nepal.Heavy rainfall in North M.P. and Delhi regions on Friday. South: Rains along South East coast decreasing from Thursday. Rest southern Peninsula with very meagre rains. Gujarat will see scattered rains in pockets. East: Increasing rains in the North-Eastern states due to the eastern end of the trough spreading in the region. "Vageries ' estimate (in the last write up) of a voretx was misplaced from east of Mumbai to just around Mumbai. And rainfall on Tuesday, (morning to evening): Bandra 98 mms, Worli 90 mms,Colaba 77 mms.Got heavy rains on Tuesday with thunder/lightening. Wednesday, will get heavy showers, with lesser duration in comparison to Tuesday's rains. The vortex is vanishing. Day time rains of around 75 mms around Mumbai on Tuesday, will drop to around 55 mms on wednesday. Thursday, a sudden diminishing in the rains. Cloudy weather, with sunny intervals. Till Sunday, Mumbai will get little rain,or passing short duration showers, with the rain guage reading about 10 mms/day.